Manufacturer of a wide range of products which include steel kitchen racks, u shaped modern kitchen, designer kitchen and island kitchen. With the valuable assistance of skilled team of professionals, we are offering an extensive range of high quality Pantry Pull Outs Kitchen Rack. With a purpose to satisfy our customers, we offer these metal vanities in various design & size. Moreover, our professionals design the offered Pantry Pull Outs Kitchens by utilizing best quality material so as to guaranty their durability. We carry out the entire manufacturing process of these Pantry Pull Outs Kitchens Racks under the direction of experts who take care about globally laid quality standards. 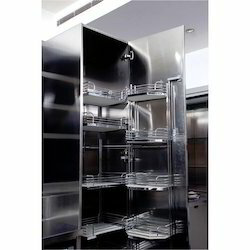 Customers can take these Pantry Pull Outs Kitchens Racks from us at market leading rates. Being the most respected organization guided by experienced and knowledgeable professionals, we provide an enormous assortment of U Shaped Modern Kitchen. 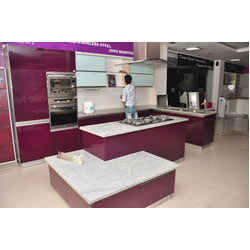 In order to assure about the quality of offered U Shape Kitchen, we use top quality material for manufacturing. After the finishing of the manufacturing process, we check these U Shape Kitchen on several quality provisions so as to assure the flawlessness. 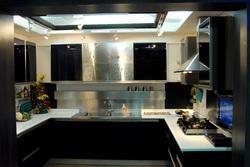 In addition, customers can take the offered U Shape Kitchen at reasonable rates. 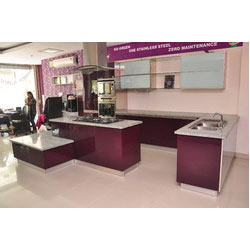 Consistent innovation, along with entire understanding of customer's needs, makes us the most renowned manufacturer and supplier of optimum grade Designer Kitchen. These Designer Kitchen are broadly valued by the clients due to their high standards of long life and smooth texture. Along with that, we also offer customization according to the specifications given by the customers to fulfill their exact needs. Furthermore, our honored customers can take these Designer Kitchen at affordable rates.